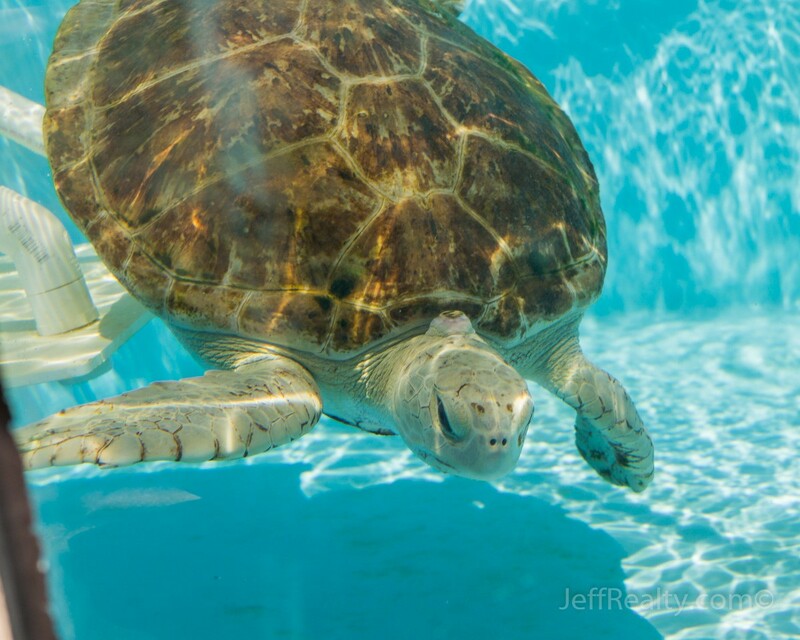 Loggerhead Marinelife Center is an excellent place to visit for anyone interested in coming face to face with several species of sea turtles while learning more about the conservation and protection of Florida’s coastal ecosystem. 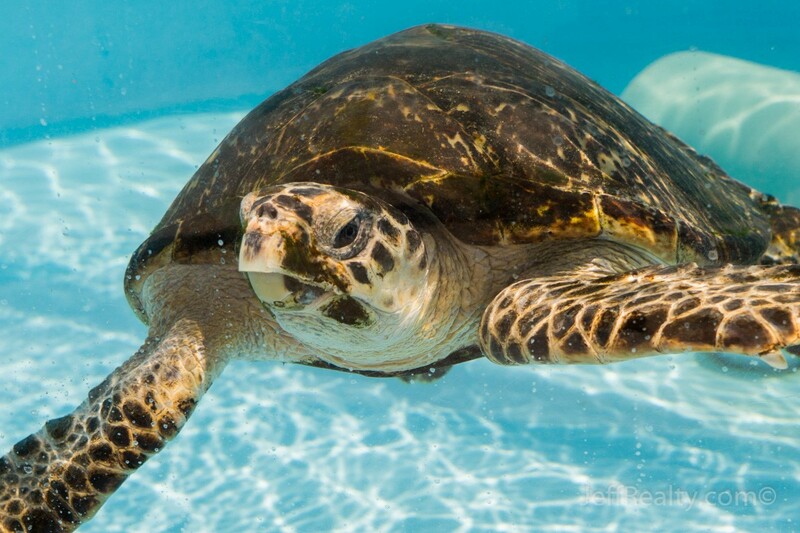 Located across from the Atlantic Ocean in Juno Beach and just a short drive from Jupiter and Palm Beach Gardens, the center’s primary focus is in the rehabilitation of sick and injured sea turtles in the hope of being able to release them back into the wild. 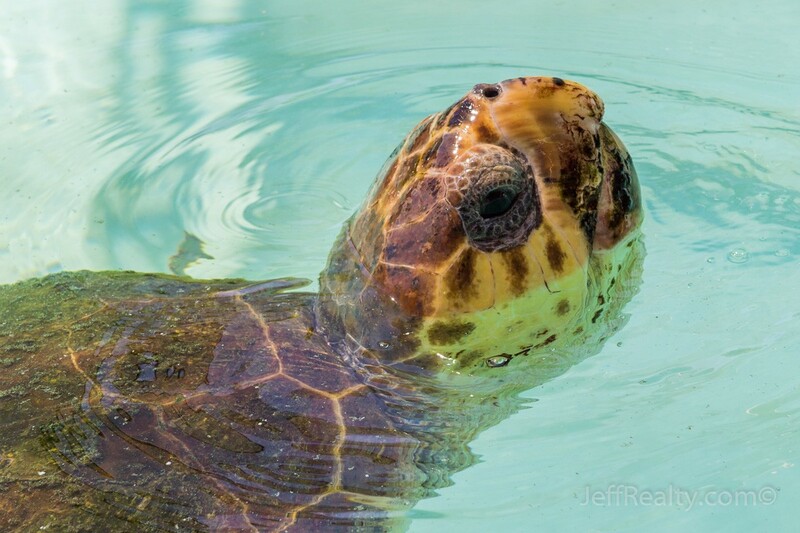 It is the only sea turtle hospital between Orlando and the Florida Keys and often accepts turtles in need of medical care from as far away as New England. 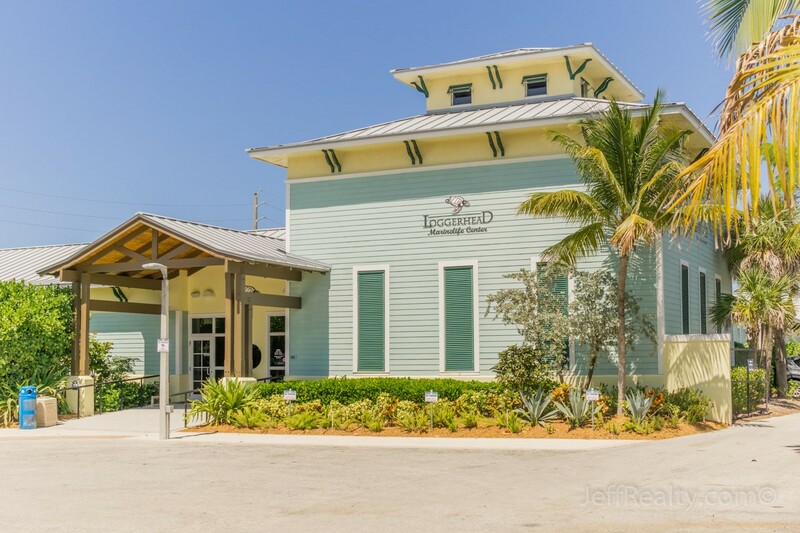 The center was started over 30 years ago by long-time Juno Beach resident and Realtor, Eleanor Fletcher. 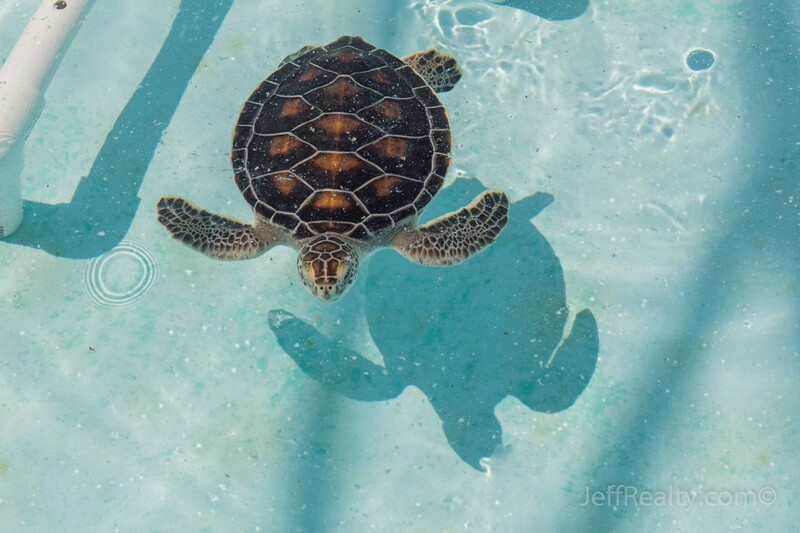 Eleanor became interested in the nesting sea turtles that would come ashore in Juno Beach and noticed a problem with many hatchlings heading toward land instead of back to sea after hatching. At the time, there was little research on sea turtles in the Juno Beach and Jupiter area, so Eleanor began conducting her own research. Thanks to her efforts, Juno Beach is now recognized as one the most active nesting sites on the globe. 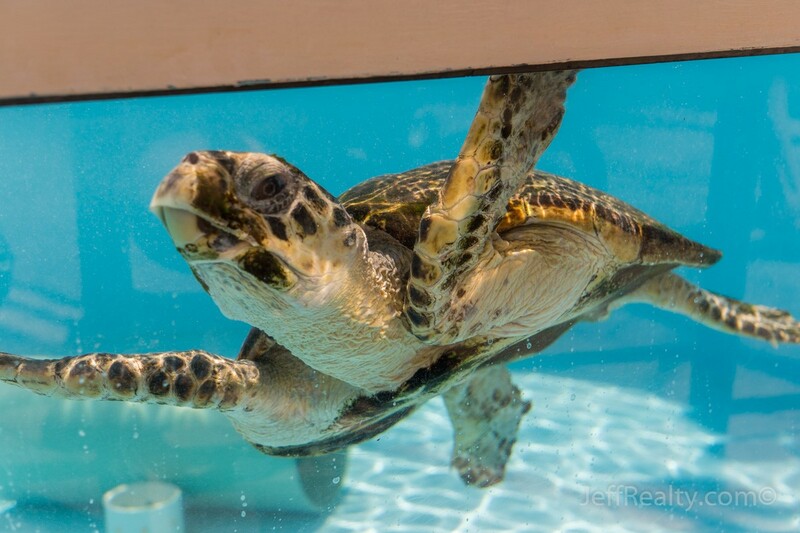 All of the sea turtles located at Loggerhead Marinelife Center are in different stages of rehabilitation and medical care. The center’s advanced hospital is one of the leading facilities in the state and includes a surgical suite, x-ray room, blood work lab, endoscope, and ultrasound. 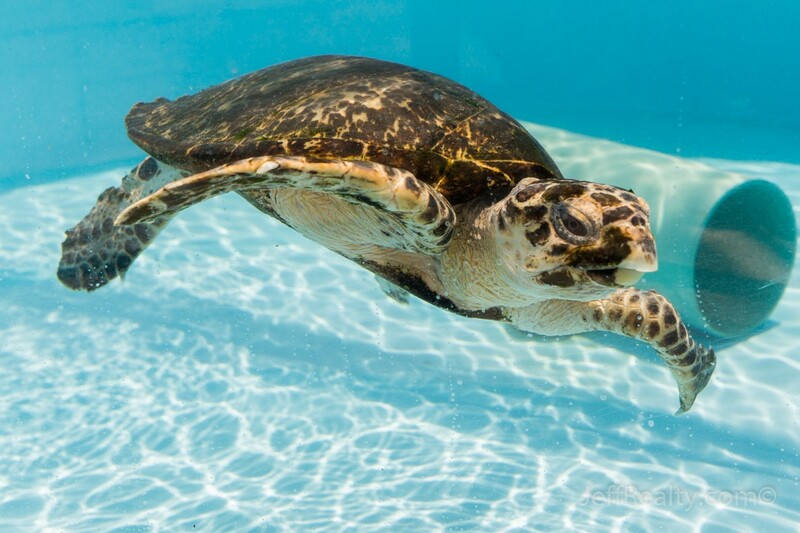 As soon as a sea turtle is medically cleared, it is released back into the ocean. 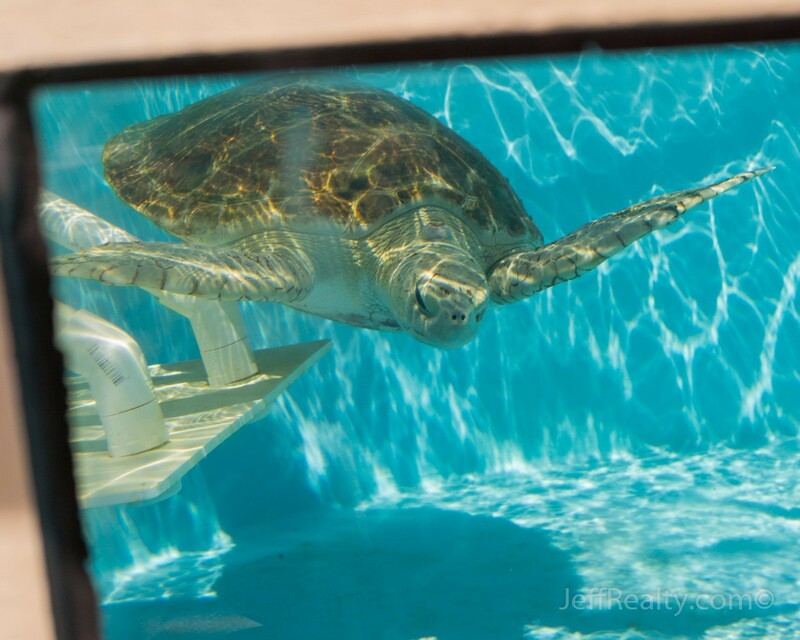 If a sea turtle is unable to return to wild, it is transferred to a different facility. 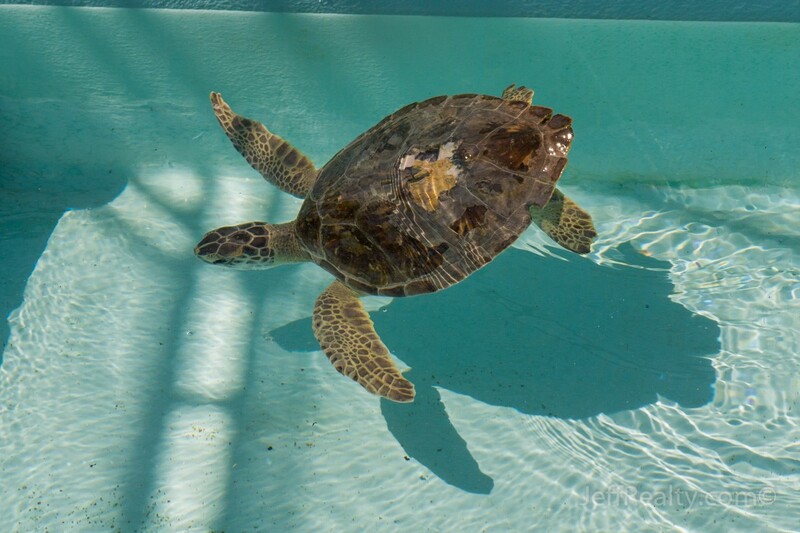 All of the sea turtles currently undergoing treatment are given names and have a card with their information attached to their tank. 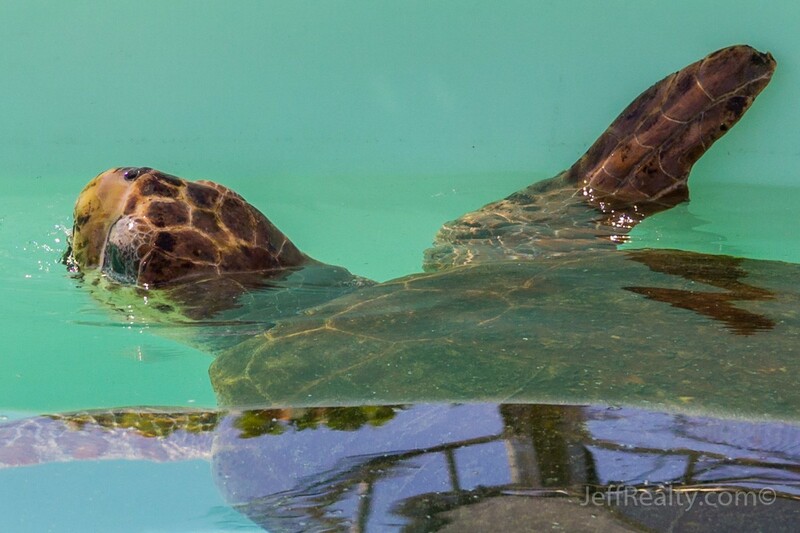 Meet Bear, a sub-adult hawksbill sea turtle. Bear was found at the St. Lucie Power Plant intake canal suffering from a low core internal body temperature, chronic debilitation, an intestinal impaction, and a heart rate of only 5 beats per minute. He is currently receiving antibiotics and weekly blood work and has started eating better. 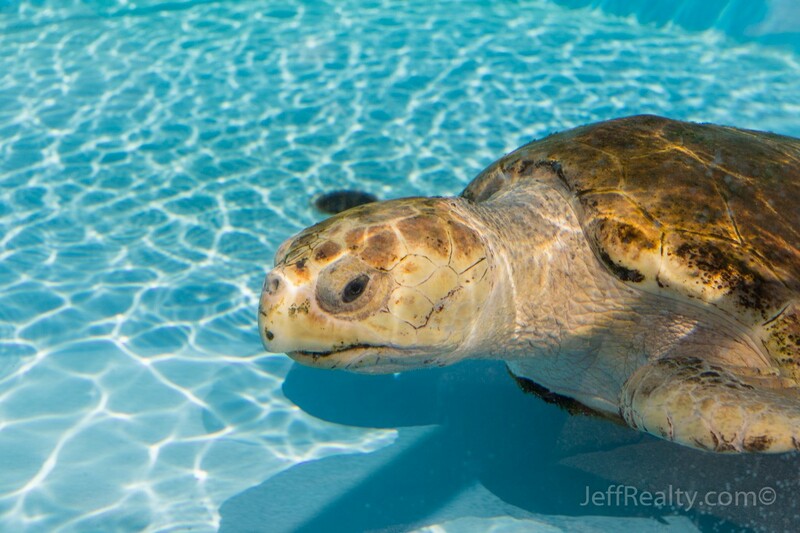 Betty White, named after the actress and animal rights activist, is a sub-adult loggerhead sea turtle. She was found floating in the Loxahatchee River with large amounts of algae, barnacles, and crabs attached to her carapace (shell). 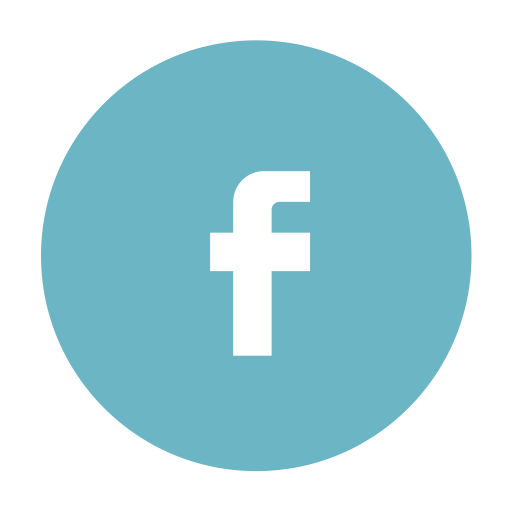 She was suffering from chronic debilitation, lethargy, anemia, an impacted intestinal tract, and low weight. She is currently receiving injections of antibiotics, vitamins, and iron. Betty is eating very well and her health is improving. 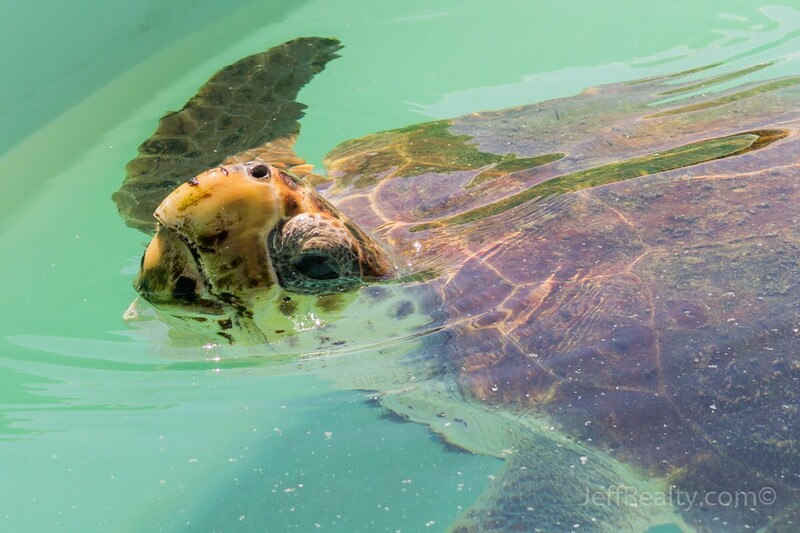 Charleson is a sub-adult loggerhead sea turtle. 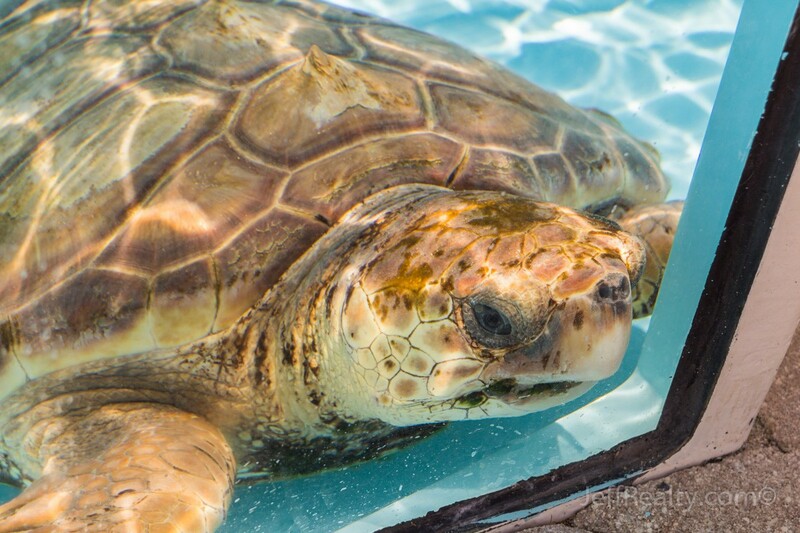 He was found floating in the Intracoastal Waterway in Jensen Beach with large amounts of algae and barnacles attached to his carapace which also had a wound from an old boat strike. He is anemic and hypoglycemic and his intestines were full of air. He is currently receiving injections of antibiotics, vitamins, and iron. He has been receiving subcutaneous fluids, antibiotics, and vitamins. 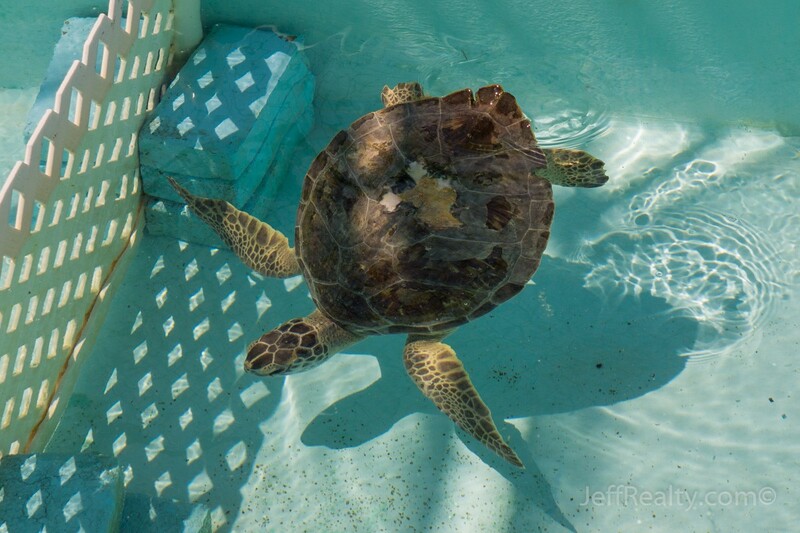 Judy is a Juvenile sea turtle that was found floating in the Loxahatchee River with a boat strike wound on the carapace that caused the lungs and spine to be exposed. Judy has been given antibiotics while a wound-vacuum system is being used on the wound. 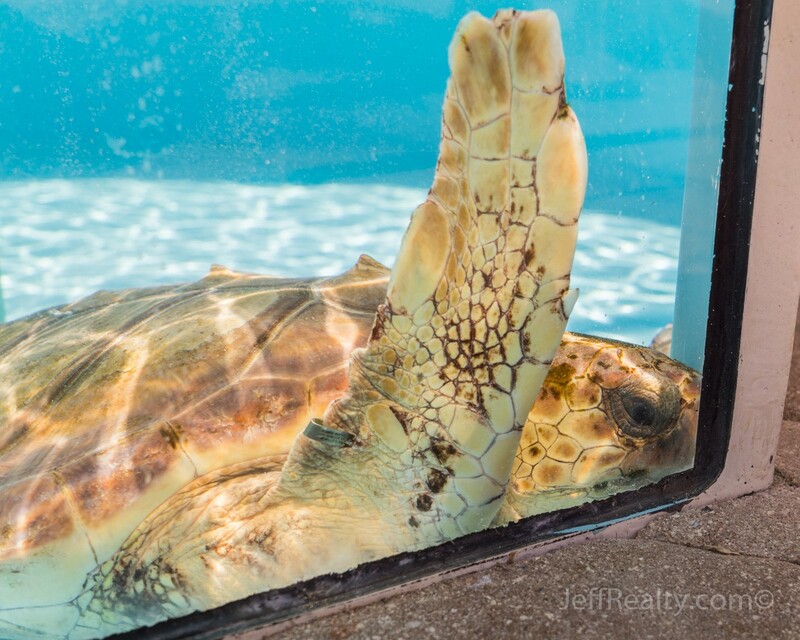 Roerig is a sub-adult loggerhead sea turtle. He was found at Sandspit Park in Stuart with large barnacles on his carapace and a large number of leeches. 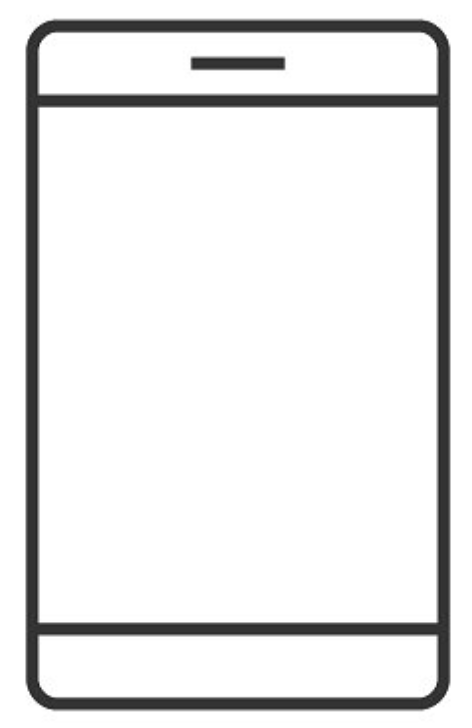 He was anemic, lethargic, and underweight. He is receiving fluids, antibiotics, and iron injections. Roerig is showing improvement and eating well. 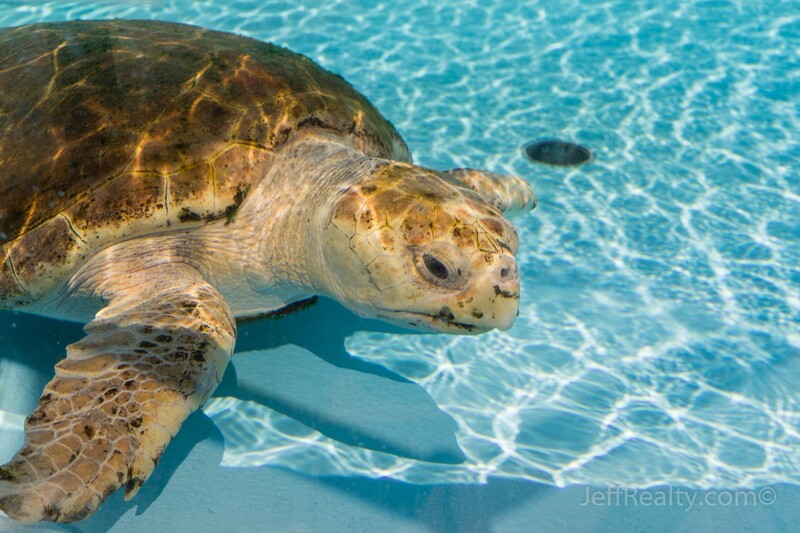 Shertz is a juvenile loggerhead sea turtle that was found cold-stunned in the Cape Cod area of Massachusetts. 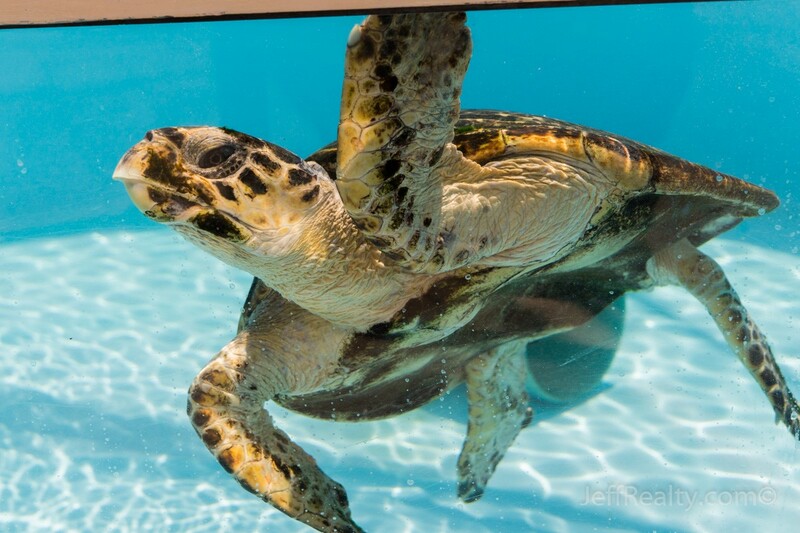 He was sent to Loggerhead Marinlife Center as facilities in the New England area were too full to accommodate any more sea turtles. There is a penetrating wound on the carapace that is believed to have been caused by blunt force trauma. Shertz has been tried on various antibiotics and treatments to raise his white blood cell count and heal the carapace wound. He has had some ups and downs, but currently appears to be improving. 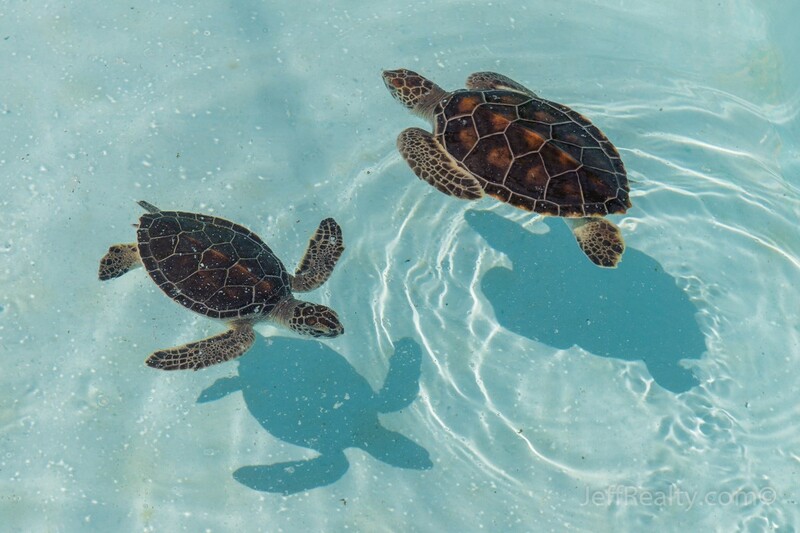 Post hatchlings are young sea turtles that made it out into the ocean after hatching, had some time to grow, then for various reasons, such as storms, strong currents, or rough surf, are washed back to shore and are unable to make their way back out to sea. 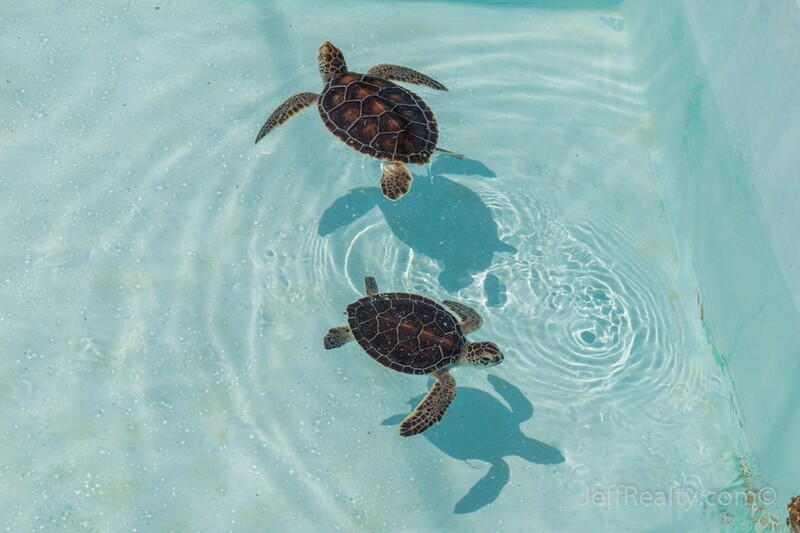 They are normally a few days to a few weeks old and are often too exhausted or too weak to swim back out to sea. 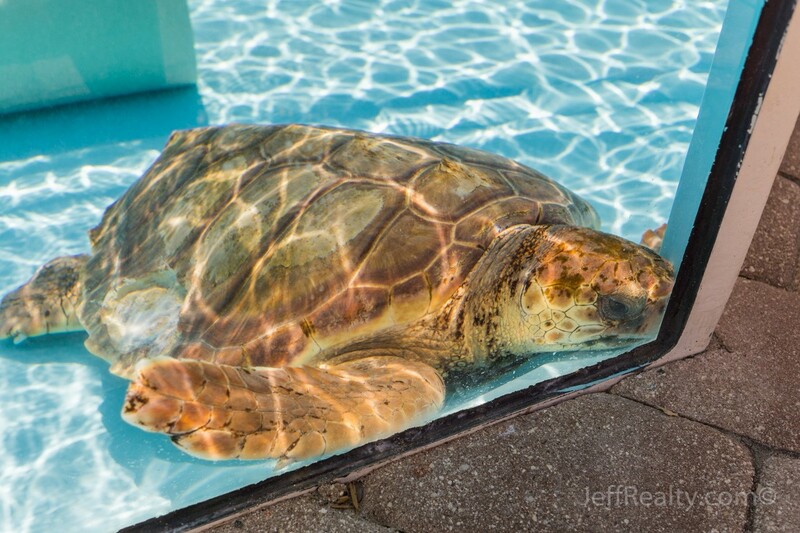 Usually the only treatment they require is about a week of rest and good eating before they can be returned to the ocean. 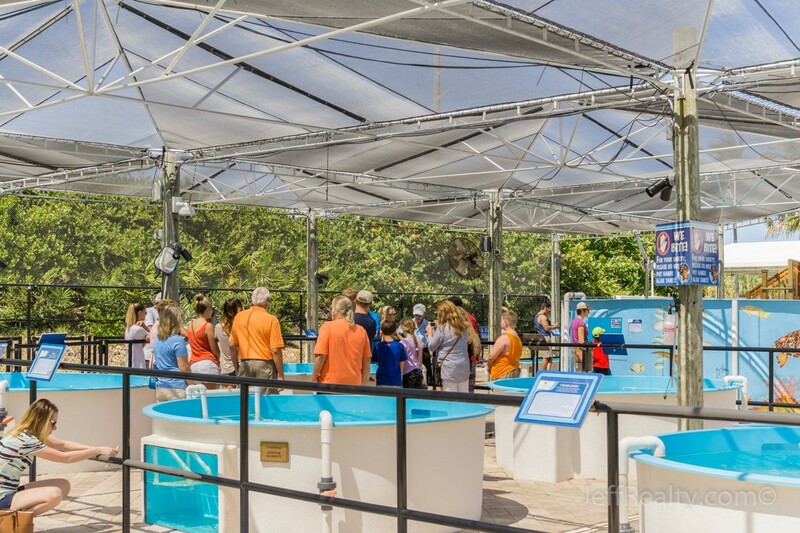 The Loggerhead Marinelife Center education exhibit is also home to a rare loggerhead sea turtle skeleton. 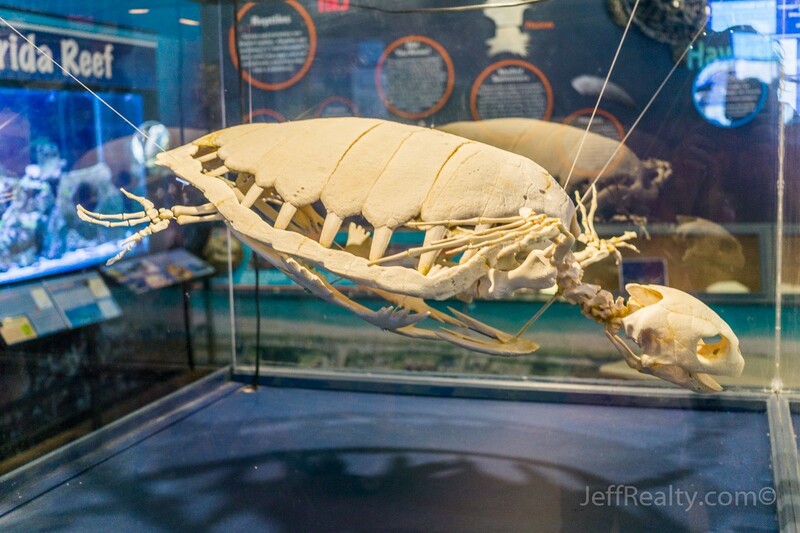 Full reticulated loggerhead skeletons are uncommon since sea turtles normally pass away while out in the ocean, causing the bones to scatter before they come to rest on the ocean floor. 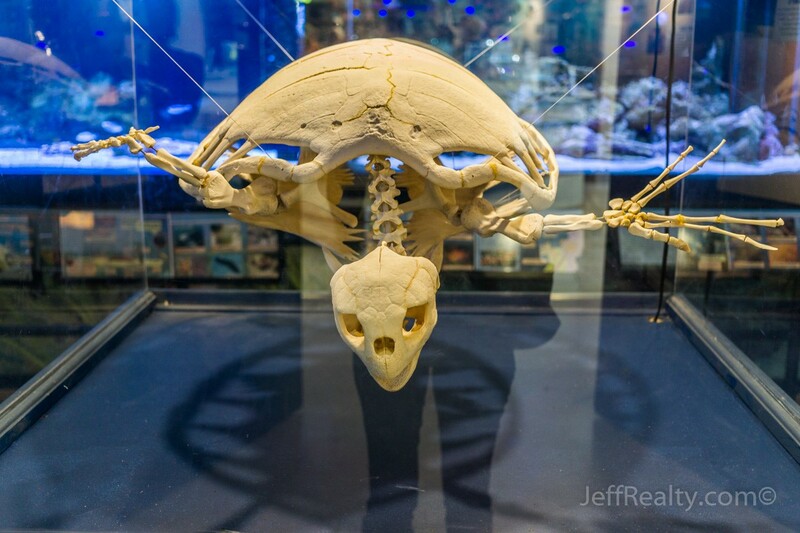 “Juno” as the skeleton was named, was a deceased, stranded turtle that washed ashore on Juno Beach and was buried for the sole purpose of reconstructing the skeleton. 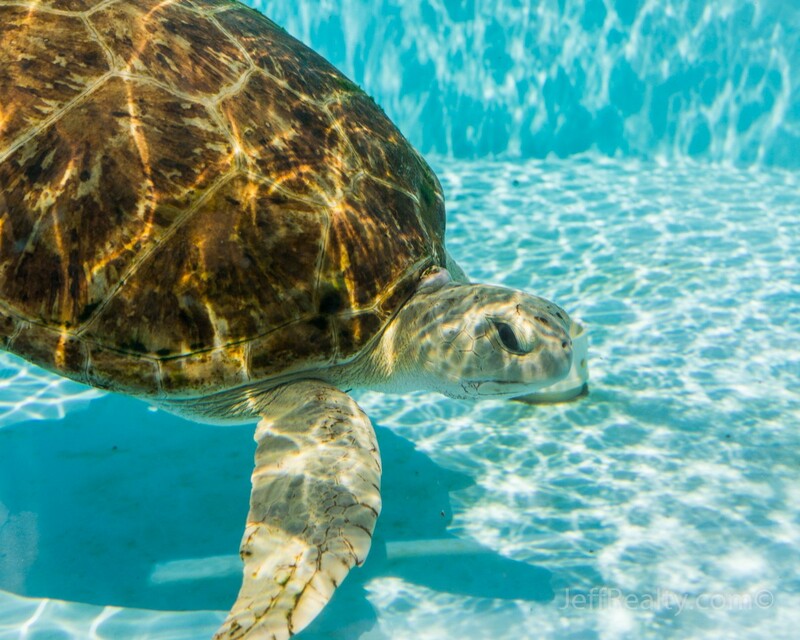 Loggerhead Marinelife Center provides many programs and events to visitors and the community, including guided turtle nesting walks, eco swim tours, and summer camps. 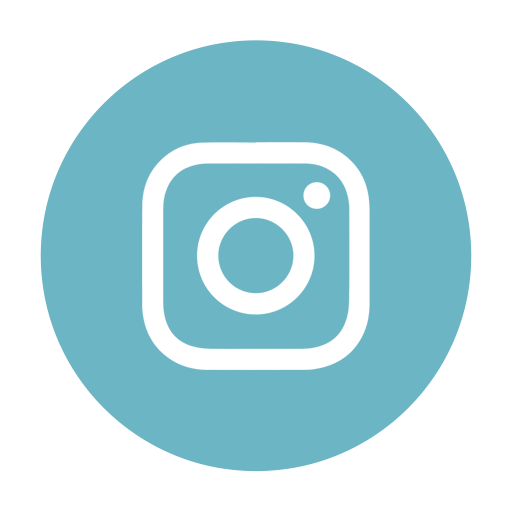 The center asks all visitors to please donate $5 upon entry which goes directly to the center, its programs, and the care of its patients. 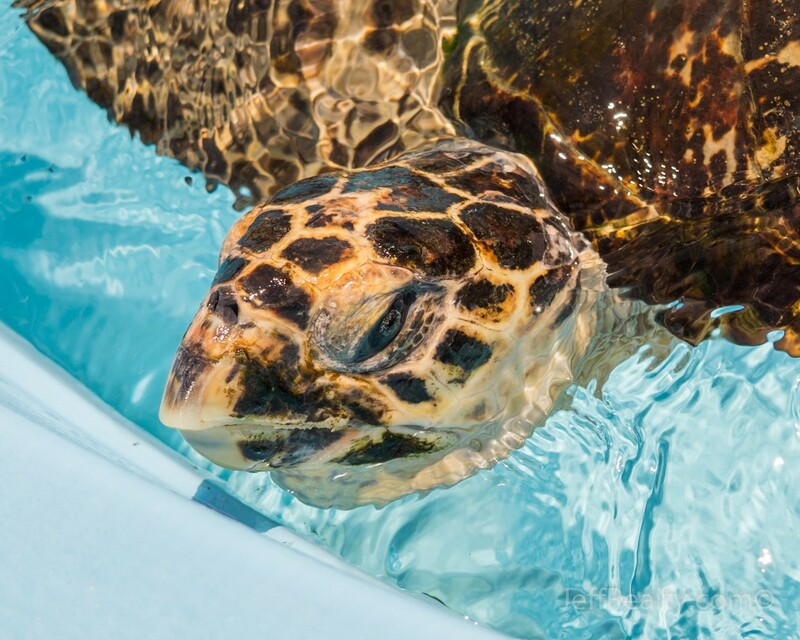 Visitors also have the option of “adopting” one of the sea turtle patients currently under care at the center with the adoption directly benefiting the continued care and treatment of sick and injured sea turtles. 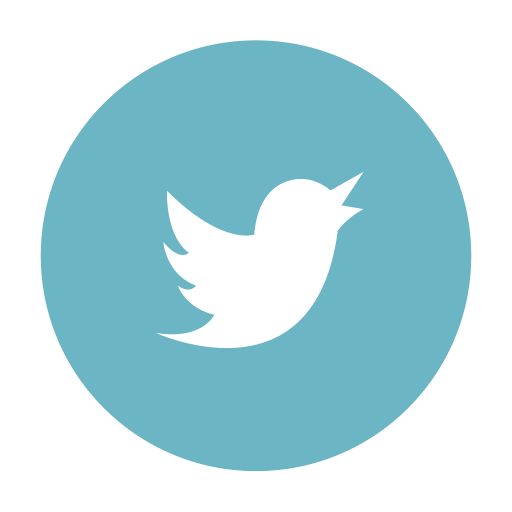 Posted in Juno Beach condos for sale, Jupiter homes for sale, Palm Beach Gardens homes for sale on May 13, 2016 at 8:00 am.